Bringing honesty and integrity to the profession! You deserve to be comfortable in your own home. 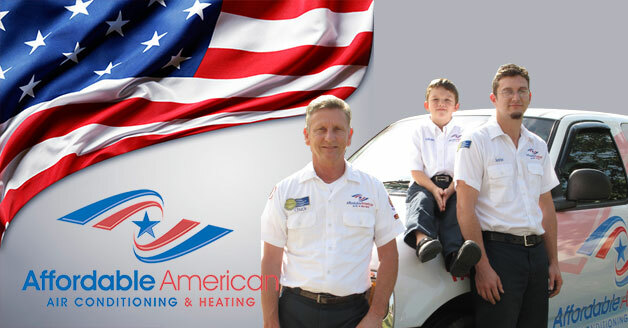 Enjoy service that exceeds your expectations by calling Affordable American Air Conditioning & Heating for quality HVAC solutions in The Woodlands, TX. Contact us now at 281-704-3696, let us know what is giving you trouble, and we will work with you to arrive at the right solution. There is nothing more inconvenient than waking up to a broken air conditioner or failing heating equipment. This is why you need a reliable HVAC expert in your network, someone you can trust to get the problem fixed without hassle. Affordable American Air Conditioning & Heating is your local heating and cooling specialist serving The Woodlands, TX and surrounding areas. We have been helping our community solve their toughest HVAC problems since 2009. If you are still deciding who to call for help, take a look at our customer reviews here, then reach out to us to discuss your needs. You will be greeted by friendly support professionals who will lead you through our simple, hassle-free process. They were thorough in their diagnosis of the problem. They did not try to sell us extra services and got us operational very quickly. The tech was professional and informative. Great experience. I had the duct work replaced, added a lot of insulation and had a solar powered attic fan installed. Competitive price, exceptional service. I have used them twice. They were very upfront and did only the work it takes to fix the problem. I'll be calling them for "check ups" as time goes by. Chuck Blair and his crew were fantastic! !, their name truly fits the business and the deal they gave us!! our home is cool once again! I highly recommend giving them a call if you have any a/c issues they will handle it and it will be a job WELL DONE! I have used them several times over the past year with a couple rental houses we have. They are very reasonable and honest. I will use them from now on! Planning to schedule a service with us? Don’t forget to print out our latest special offers here and present to your technician upon arrival. We provide many opportunities for you to save with competitive prices and seasonal deals. Check back often for updates and more ways to save on future services! We are a full-service HVAC company for homeowners who are looking to improve their indoor air efficiency and save on energy for the long term. Our services not only include basic repairs and installations, but also annual maintenance as well. 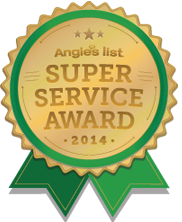 We do it all, from heating and cooling tune-ups to attic insulation and air duct cleaning. Our solutions fall under what we call our Whole Home Comfort approach. It’s important to treat your heating, air conditioning, ductwork, and other HVAC equipment not as separate components but one whole system working together to provide you with a comfortable home environment. This is why you need one service provider who can take care of all of these different components and make sure they are all working in harmony for the life of your home. Affordable American has the experience and resources to carry out quality solutions no matter your needs. Make us your go-to expert when it comes to solving any of your HVAC problems. 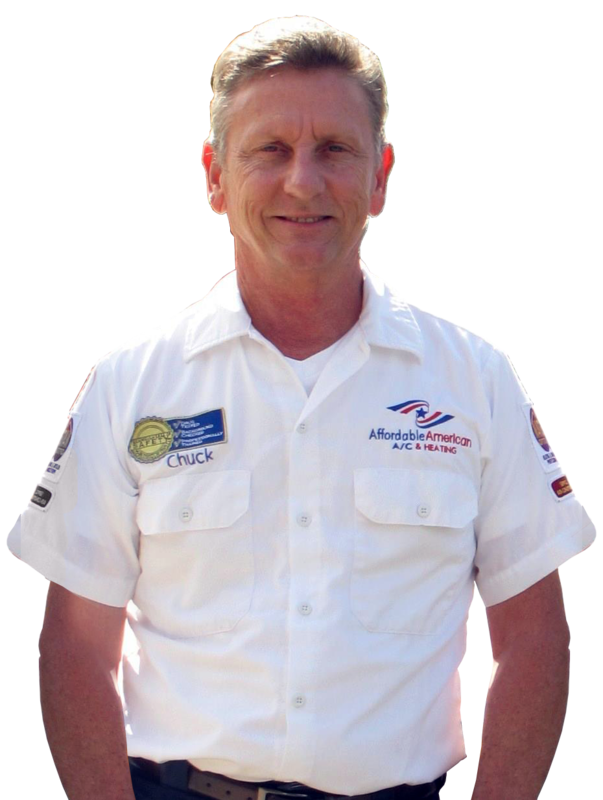 We are a veteran-owned company dedicated to providing honest, upfront service for all of our customers. Our process is kept simple and straightforward so you always know what to expect. We provide you with upfront quotes that remain the same at the end of the job. You never have to worry about hidden fees, upselling, or receiving poor work quality. At Affordable American, we stand by our word and make working with us as transparent as possible. If any changes need to be made during the course of a job, we will let you know first before going ahead with the changes. We like to provide our customers with options before getting started, so you are able to receive the most cost-efficient service to fit your specific needs. You can expect a friendly greeting on the phone. We are passionate about customer service and make every effort to ensure that your experience with us is a pleasant one. Dealing with HVAC trouble is already stressful enough. The last thing you need is more hassle with your service contractor. That’s why we treat every service call with the same level of urgency, offering fast turnarounds and results that will leave you with nothing but greater peace of mind. When you work with Affordable American, you can count on personalized solutions that get to the source of your problem. We provide tips and advice on how to save energy and make your home comfort systems more efficient throughout the seasons. Our services are customized to meet your property’s needs as well as your budget. Every member on our team is invested in our customers’ safety and comfort. And part of that is ensuring that you receive top-notch service from start to finish. We help families just like yours breathe easier, sleep more comfortably, and simply enjoy the comfort of their own home. Join your happy neighbors and work with Affordable American to start experiencing the whole home comfort you deserve. Need new air conditioning or heating equipment? Free estimates available on replacements. Call us today at 281-704-3696 to discuss your options and be on your way to a healthier, more comfortable home! Copyright @copy; 2018 Affordable American Air. All Rights Reserved.